The PB4Y-2S which crashed, was from this squadron which operated from NAS, Guam. John J. Witten Austen Doolittle, Claude Pope, Earl Beach, and Mike Iverson have contributed historical data and photos to round out the story of SAR Dec '53. Click on the link to see their stories. 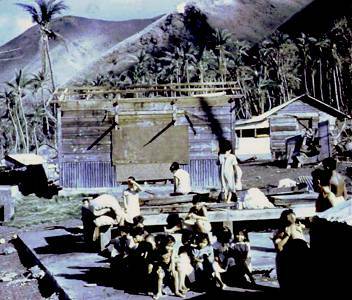 It was mid December in 1953 and a typhoon was roaring through the Northern Marianas. The Whitehurst was in Apra Harbor, Guam, when ordered on a Search and Rescue (SAR) mission to find the crew of a missing navy weather plane. We got underway in late afternoon and entered heavy seas as soon as we departed the harbor's channel. I took the starboard lookout watch on the bridge as soon as the special sea details were released. Green water was breaking over the 02 level and heavy splash saturated everyone on the bridge. Heavy seas continually battered the ship as we steamed north some 300 kilometers to the site where the aircraft was thought to be down. During the night, the port side ammunition ready box for Mount 31 was carried away, damaging the hatch to the ammunition spaces and the port side lifelines. Although the typhoon had moved on the weather remained bad with high winds and high seas for days. Low cloud cover hampered the air search while poor visibility and wave height made the lookout's job difficult. After a several days of fruitless searching by air and sea, a search plane spotted what appeared to be aircraft wreckage in the crater of the extinct volcano known as Agrihan Island. According to "Swede" Allgren, while steaming near the island at night, signal fires could be seen. Memories are not very clear as to whether the islanders were questioned before returning to Guam for the Marine search party or after the marines were put ashore. It was learned that they had no homes left and no food except some canned milk. My squadron, Weather Squadron One (VJ-1) was the outfit that lost the crew on that flight. Ltjg. 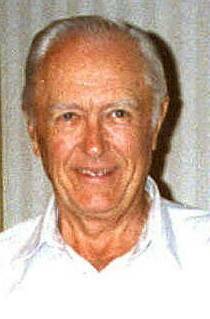 Fred Troescher traded Duty Officer with me, as I was supposed to go out on that fatal flight. However, Fred called me the night before and asked if he could take the flight since the Air Force had been covering all the Typhoons for the past week or so. Our squadron and the weather outfit from Anderson AFB had had some mix up in the flight and we damned near had a midair collision. Sooo, the AF decided it was best if only one outfit did the reconnaissance on the typhoon. Only that night the AF had trouble getting an airplane up for the flight and asked the navy to cover the typhoon. When I reported for duty, I discovered that Crew One had left for the day's recco flight, covering that typhoon. If my memory serves me correctly, when we penetrated a typhoon we were to establish radio contact with base every 30 minutes. I think the Radioman working the Duty Radio that day was John Walpole. He was our radioman in our crew, Crew 2. Lcdr Perc Kedigh was our Plane Commander, Scotty Jenkins was the copilot, and I the 2nd pilot and navigator. Wes Mellange was Plane Captain, I do not remember the rest of the crew, but I am sure some of the fellows in VJ-1 will be able to fill in the blanks. Back to the flight. After John had not received any transmission from Crew One after the 30 minute time lapse, he notified me since I was Sqd Duty Officer. I reported the situation, no flight message for more then 30 minutes, to Perc. In turn we notified ComFairGuam, I think that's who we called, it's been 52 years and all the facts are not coming to the frontal lobe. I believe a meeting was held and the plan to start the search was put into play. Anyway, the very next morning all the planes in our outfit were sent out to search the suspected, downed PB4Y-2. missing aircraft, the search was called off. The time loading the islanders and their possessions extended from late afternoon until well into the night. There was a small pier to which the residents carried their belongings. With working parties on the pier and in the motor whale boat, sailors made trip after trip from the ship's anchorage to the pier and back. I was on one of the later whale boat crews. It was a dark night and the, boat's wake, bow wave, and every bubble in the splash glowed with a brilliant and beautiful phosphorescence. Every thing the natives owned was carried back to the ship and loaded aboard over the port quarter. The swells were only moderate but still, the whale boat rose and fell three to four feet with each wave that broke against the side of the ship. 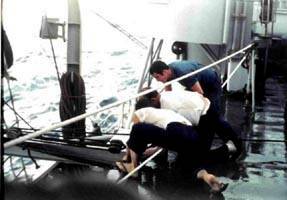 Several men leaned over the life lines reaching for items handed up by men in the whale boat. One of the items I help load aboard was an old treadle sewing machine. It was a real struggle to hold it high enough for the men aboard the ship to grab while the boat was rising and falling . After the islanders were safely aboard ship, another party of Gunners Mates went ashore to write a sad chapter to this story. Whitehurst could not evacuate the chickens, livestock, and several dogs, owned by the islanders. It was decided that to protect the rest of the stock, the dogs must be killed. GM1 Ernie Mlynek, GM2 Howard Moebus, GMSN Elmer Causey, an interpreter, and perhaps some others, took carbines ashore to carry out this unpleasant but necessary task. I am not sure how many islanders were taken aboard but the figure 112, is stuck in my mind. Crewmen who used the after sleeping quarters gave their bunks to the refugees that night and still, many of them had to spend the night crowded on the fantail. No one got much sleep that night. Fortunately the trip to Saipan required only one night and day. The picture below was taken in early morning sunlight after a rough night in open air on a hard deck. Agrihan juts straight up from the sea to a height of nearly 3000 feet. It is 40 square, near vertical, kilometers of dense growth. Whitehurst was dispatched back to Guam to pick up a party of marines whose task it would be to climb to the crater and determine if there were survivors. By the time we returned to Agrihan the seas were relatively smooth and Captain Marvin D. Jones steamed at full speed toward the island. On the morning of our arrival some of the marines had come up to the bridge for a good view as we approached the island. The weather was so clear that it seemed close upon us when I heard a young marine say, "If he doesn't slow down, we'll run into it." I had the Bridge to CIC phone watch at the time so I asked CIC for the range to the island. We were 46,000 yards (23 nautical miles) away from it. Upon arrival at the island, 24 December 1953, the marine party was put ashore and Captain Jones decided to send a search team from the ships crew as well. We know that GM1 Ernie Mlynek, and GM2 Howard "Moe" Moebus were in this party. It probably consisted of an officer, radioman, a medic, and several others. Allgren's recollection of events, as told to him after the gunners mates returned to the ship: The marines started directly up the mountain toward the crater where the wreckage was thought to lie. The undergrowth was so thick they had to make their way with machetes while the Whitehurst party found natives and asked about the wreckage. They learned of a route to the crater which provided much easier access than the way chosen by the marines. Though the sailors had to walk farther, they reached the rim of the crater first. The point where the weather plane had struck the wall was clearly visible as was the fuselage and tail section lying on a ledge farther down. There were no signs of life. When the marines arrived at the crater, some of them were sick, apparently from coconut milk they drank on the trek to the rim. After descending to the wreckage and seeing the condition of the bodies, it was decided not to retrieve them. The search was an overnight expedition, during which time the Whitehurst steamed slowly around the island. The ship's crew enjoyed Christmas Dinner and a "lazy day" while thinking of the hardships their buddies had to be enduring as they climbed to the crater. Radar man Gene Paquette with help from several old "what's-his-names" wrote the following poem after the search parties went ashore. That's where you'll find the Whitehurst on Christmas Eve. Now it's Christmas and all is calm. But the Whitehurst is still raging on. The crew is full of Christmas joys. As the Whitehurst sails with its boys. Sailing on Christmas isn't so bad. But on the Whitehurst, Jarheads we had. And on the Whitehurst no one gives a damn. So it's Christmas and all isn't well. So on the Whitehurst we fight the swell. So bring on the whiskey, bring on the gin. Maybe the Whitehurst will bring the flyers in. The following information was received, Feb 2004, from Frank Harding CDR U.S.N. Ret who was an Ensign at the time of this mission. when I went to Pensacola for flight training. couple of days later and found no survivors. By Glen Anderson GM2, written at time of the incident and preserved by his mother, they are reprinted here with Glen's permission. By now we should be well on our way to Japan but tomorrow we're heading back to Guam. It's a long story of what happened the last few days. I had the watch Thursday morning when a phone call came in, telling us we were on standby to go to sea because a plane had gone out on typhoon recognizance and hadn't been heard from in two hours. So by two o'clock that afternoon, it was still not heard from so we were sent out to see if we could find it. We headed directly into the typhoon because that's where the plane gave its last position. The actual typhoon had a radius of 100 miles from its center. We steamed right into its radius 60 miles from its center and believe me it was rough. All hands were issued life jackets and nobody could go out on the weather decks at all. The waves were mountainous and the wind was blowing mist and spray high into the air making everything a dirty gray color. For a while I didn't know if this tub was going to hold together or not. Just about everybody aboard was sick. Finally we got orders to delay the search and head for smoother water. That night we were steaming to a general search area when we saw 2 flares. We searched the area at night but couldn't find anything. The next morning planes came to help but still couldn't find anything. We covered that whole area for miles around but still couldn't find a thing so we went to another area to hunt. One of the planes spotted some debris in the water so we went to check on it but found only some pieces of trees and a canoe that the typhoon had blown off an island. So that just about bring it up to date. So far we're still searching but I think it's hopeless. It's been 6 days since they went down and in this rough sea, I doubt they could have lasted more than a few hours. We are kind of getting low on fuel so I think tomorrow we'll secure the search and head back to Guam. I don't know now when we'll get to Japan or even if we'll go. We might go into Guam, refuel and pull right out, Who knows? Not I. We didn't make it back to Guam yesterday after all. We were just about ready to give up on the search when one of the planes that was helping in the search went down by some island so we had to go and hunt for it. The island was not known but from his last report he was near Agrihan . So we went to the island of Agrihan which was not supposed to have any people on it. We tried to make a landing at night because we could see lights, but the water was too rough and couldn't see where to land. So the next morning we made a landing and found 112 people. The typhoon had hit the island so all their food was gone - had enough for 72 hours. They couldn't live there any longer, and they wanted to go to Siapan so we loaded man, woman. and child, with bag and baggage, aboard and took them to Saipan. We had to move out of the compartment that I sleep in so the women and children had some place to go. What a mess they made. They were dirty and some got sick. Not used to going to sea I guess. I sure felt sorry for these people though it will be about three years before they can move back there. I guess in the meantime the government has to take care of them. Right now we are on our way to Guam to refuel. After that I don't know what we'll do. I don't think the plane has been found, so we might go right back out to search for it. So don't be surprised if you don't hear from me for a few days. Can't tell what's going to happen. At least I hope we don't have to spend Xmas at sea. P.S. The 112 people had 110 dogs which we had to kill before we left. Man what a slaughter. Well here it is Christmas and we are back at Agrihan. What a place to have Christmas -but it seems just like any other day. I sure thought a lot of you people at home, and wondered how your Christmas was, and wishing I was there. With any luck at all I should be home by the next one and telling sea stories about this one. I suppose you are wondering what we're doing back at Agrihan. Well we went to Guam to refuel after letting the natives off at Saipan. A plane had flown over the island of Agrihan and found the wreckage of one of the planes. So we refueled and picked up a bunch of marines that were trained for rescue work, stayed in Guam about four hours and pulled out again. We got to Agrihan the next day and put the marines ashore and laid off the island to await results. Agrihan is a volcano with a crater 600 feet deep in the center and that's where the plane is. The marines could get to the top but it is just about always cloudy so they couldn't see where to go. They came back once and got more food and water for another try. The captain got impatient so he sent a party of white hats up another side. They also reached the top but couldn't see for the clouds. We got a message from them this evening that they were cold wet and hungry, and were returning in the morning. So for the last two days all we've been doing is going ashore in the rubber boat at two different places, taking in food and water. Today the last place we landed at, the tide was coming in and the surf was high and when the rubber boat reached the beach, a wave caught it and turned it and its crew over. They couldn't get back out because every time they would try, the surf would rough them up again. So we had to take the motor whale boat in to tow them off the beach. I had to go along with a line throwing gun to shoot them a line. We finally pulled them off the beach and free of the surf. Then when we returned to the ship the waves were too high, so we couldn't get the whale boat back on board. So we had to ride the whale boat through about 3 or 4 miles of rough sea to a cove where the ship came in to pick us up. So that is the way my Christmas was spent. Just like another day. Even the dinner wasn't too good. Not a creature was stirring. Not even the prisoners-at-large. The sailors were all nestled and snug in their sacks. While visions of sirens danced 'round their racks. Our stockings were hung on the pipe overhead. In hopes that Chief Kessler would put in some bread. We're still on the lookout for flying machines. I jumped from my rack and ran up the ladder. I looked thru the hatch and what could be seen? There was old Agrihan, bearing 3-15. It must be those "Jarheads" in a ravine. We'll get to Japan, that's what we're after. On Turner, on Connors, on Wilkins and Day. If we get the job done, there'll be no delay. Dash away, dash away, mighty fast. It must be C.O. Jones snowing the boys. Down the stack St. Nick came with a bound. For it was too hot in these here seas. I knew right then, no more trips to Palau. That's as close as we'll be to getting snow. We wondered right then if that's Santa Clause? We wondered right then, "what's with this square"? There he stood, sweating a lot. He said, "How does it get so damned hot?" We knew right then, we were on his list. Grabbed a paddle and threw over the raft. We knew right then, he would be gone with a breeze. An excerpt from Commander Meredith's writings follow. from "A Handful of Emeralds"
Before Dinner that evening, as we were speculating on the number of bags of mail waiting for us on the dock, an “Operational Immediate” message came from Guam. I was ordered to increase speed so as to return to port as soon as possible; no reason given. We cranked her up to top speed. The forced-draft burners began pouring nine hundred gallons of oil per hour into the fireboxes - oil all the more precious because we had so little of it left. The ship shuddered and vibrated as it passed through its critical speed - about nineteen knots -and smoothed out as it “put on legs” and gained more speed. The wind and spray of our going stung the faces of the men on the open bridge that night, and for all of us it was like riding in a boxcar. But dawn found us waiting at Orote Point, requesting permission to enter port. 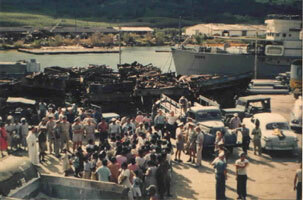 On Guam, 17 December, at the headquarters of ComNavMar, I learned the reason we had been hurried into port. It seemed that Typhoon Doris, whose existence I had almost forgotten in the peaceful waters around Ponape, had hit the Marianas with full fury - damage to the northern islands still unknown. Worse, much worse, a four-motored weather reconnaissance plane was down somewhere near Pagan Island, two hundred miles north of Saipan, and my orders were to stand by on one-hour notice to join the search. Our sister ship, the Whitehurst, was already on the scene. Any thought of liberty on Guam was swallowed up in preparations now afoot. Conduct of a search and rescue mission (SAR) is a highly refined operation requiring coordination between all services in the area - army, air force, navy, marine corps, and coast guard. The SAR organization at Guam was centered in a typhoon-proof shelter at the Naval Air Station, where Lt. Comdr. Ray Tufts presided over a battery of teletypes, radio receivers and transmitters, telephones, charts, and plotting boards. The atmosphere was tense when I arrived, for the men and officers called to duty at the Rescue Coordination Center (RCC) were daily intimates of the missing plane’s five-man crew. The plan at first was to send the Hanna out right away, but it was then decided that we should wait until morning. The pages of my journal tell the story of the next few days better than I can, the sharp edges of emotion and the fatigue having been long since dulled. I write this at 233OK, with the ship making 20 knots on course oo8 True, which should bring us by about O8OOK to Agrihan Island, where I believe we will be directed to send a landing party ashore. So far, my orders are only to get there. Agrihan is about 300 miles north of Guam, and is the top of a gigantic volcano rising 15,000 feet from the ocean floor to the surface, with another 3,160 feet on top of that. It may be necessary for the landing party to go all the way to the crater’s edge for a look inside. The typhoon is still in the general area, at the moment 240 miles WNW of Agrihan. Hope she moseys off to the west. Bespoke the merchant ship Graigaur bound for Fiji, meeting on opposite courses off Saipan. He told me weather was very rough, with swells from Doris, where he had been. The search plan for today arrived by radio at 1 AM, and is quite a complicated affair. My own job consists primarily of scrutinizing the three islands of Agrihan, Pagan and Alamagan. Secondarily I am responsible for maintaining contact with five Air Force search planes. They are supposed to check in every thirty minutes with an “operations normal” message, and on the whole the system has been working very smoothly, RCC sets up the various search sectors. Arrived off Agrihan about 0900K. Decided against sending a landing party ashore because of the surf... The Island has been thoroughly worked over by the typhoon: two or three buildings on the SW side have been demolished, and whole forests of coconut trees have been (to borrow Holmes’s expression) shredded. The famed ability of palm trees to withstand the blast by yielding to it hasn’t saved them this time. Thousands of trees have lost all but a frond or two, and hundreds lie about like dumped handfuls of matches. I wonder what the top wind velocity here must have been. Several people from the village came down to the shore, but we couldn’t reach them, and they didn’t give any sign of distress or dismay ... or perhaps I should assess their attitude more along the lines of inborn resignation to fate. Circled the island at a range of 500 yards, failing to see any trace of the lost plane. About noon we left for Pagan Island. Pagan is blessed with a tiny spit of land curving out arm-wise to form a cove three hundred feet wide off the slender waist of the island. It was calm enough there to land a boat-load of men and two officers (Rayner and Lee). These went ashore at an old Japanese wharf. Meanwhile I held the ship about four hundred yards off the murderous black rocks against which surf crashed and exploded. One could only guess the power of the geysers shooting over a hundred feet in the air. Rayner learned that although the storm had given the natives some 50 hours of acute danger, they had fared well and needed no medical assistance. 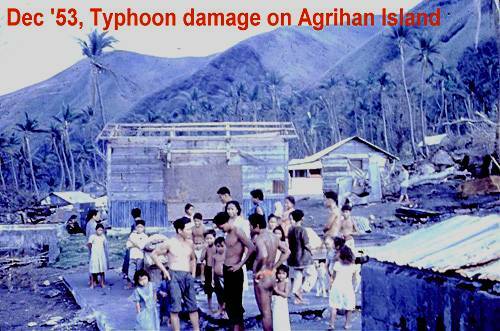 Crops were destroyed, also about 8 dwellings, but the coconut plantation was not as hard hit as at Agrihan. In recovering the boat I had much fear for the men in it because of the roughness of the water. One man did get a 2 inch gash in his forehead from a swinging block.Circled the island, a jumble of volcanoes old and new. 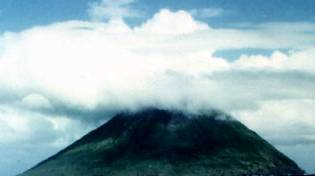 Volcanoes upon volcanoes, cones, and lava flows tumbled down each other’s sides, wreathed in vapor. Here, as elsewhere, no indication of wreckage. I am on-the-scene controller, with two ships and six planes. Busy day. (Later) Had fair communications all day and dashed here and there at the insistence of RCC. All searches negative. Investigated debris at L 20 degrees 20’ N., 145 degrees 34’ E., but it turned out to be only coconut driftwood: bits of logs freshly stripped of bark, nuts, fronds twigs ... all within a 1000-yard circle. The bright yellow would certainly look like a partially deflated life-raft from the air. (Later) Am now writing this with the greatest of difficulty owing to the vibration of the ship. Another plane may be down - “Playmate 19” as he is known on the voice circuits. He hasn’t reported “operations normal” since midmorning. We notified RCC a long time ago, and now a new emergency has been declared. We are steaming now at 21 knots for Pagan Island, where he was last heard from. Whitehurst, who is north of us, is going to Agrihan. All of our planes have been put to the search, but it will soon be dark, and they are running low on gas. The missing plane may have flown too close to a volcano and have been caught in one of the tremendous downdrafts which sweep down their flanks, or, for all I know, into their craters. If it is a crater, the wreckage would be obscured by clouds indefinitely. Now passing Maug Island ... we go past Asuncion next, then Agrihan. Expect to reach Pagan about 2200K. (Later) Passing Agrihan. A plane has sighted some debris; at Alamagan, I believe. Anyway I’ve been told to keep going down to that island. Earlier, a plane reported seeing a flashing light on the southwest corner of the island. This of course may have been an ordinary light in the village there. Asuncion, my first view of it, is an awesome sight ... so simple and majestic a cone, and so very evil ... heaving its black shoulders out of the sea, curving disdainfully into its private cloud ... no one can see its face. Streaming away in the evening sky from its dark summit, a line of sooty clouds ... I can get two hours’ sleep now, before midnight and Alamagan. Sent landing party ashore at Alamagan’s southwest village. Have had two planes, one of which dropped flares to show location of debris. One flare landed in the water offshore, the other one on the island. Now it turns out that the debris was nothing more or less than the southwest village. Landing party reported by flashing light that natives know nothing about plane crash. One woman had been badly hurt in the typhoon, and the hospital corpsman treated her. The landing party is now back on board. (22 hours later) I set a course for Pagan Island about 0300 (yesterday morning, actually, though it doesn’t seem so). My reported intention reached RCC about the same time as their daily search plan reached me. I was supposed to spend the day checking the area around Alamagan and Guguan, to the south. However, I saw no reason to change my initial plan, which was first to revisit Pagan and question the natives there about the new crash. Reached the now-familiar cove at sunrise, put a landing party ashore, and had them back on board within the hour. Circled the island again, then left for Alamagan and Guguan to carry out orders. At Pagan my people learned only that a blue 4-engine plane had flown over on the day before and dropped a flare. Made a third landing at Alamagan, this time on the northwest corner, and probably the most difficult landing so far, for the surf was really high and the beach composed of football-size rocks. No information here, either, except that the inhabitants have run out of supplies. I passed this along to the District Administrator to act on. The people will at least have plenty of coconuts to eat. Inevitably a plane saw a patch of debris many miles away from our position, and I had to steam 84 miles at top speed to look at few shredded branches. It also wasted the time of a 4-engine plane for five or six hours. Very discouraging. Now I’m night-steaming near Saipan, and tomorrow shall be straight man (guide) for one of their “checkerboard” air searches. Started out with ten planes today, all navy and coast guard. The Air Force is running its own show, staging planes from Japan through Iwo Jima. They will use an airborne RCC, but we’ll monitor their circuits anyway, as a safety measure. Shortly after starting the checkerboard search referred to above, one of our planes reported definite aircraft wreckage inside the crater at Agrihan, strewn along the southeast wall. Now I am making 21 knots for that island, and expect to arrive about 1715K, when it will already be dusk. Landing party will have to climb the mountain in the dark. Whitehurst yesterday evacuated all the inhabitants, so I’m asking him to obtain trail information from the native chief. Also asked RCC for an airdrop of batteries for my portable radios. Rayner and Bland are to lead the rescue party. Passing Pagan, making good speed. We should be lying off Agrihan by 1632K. So far no reply to my request for batteries. I will not like sending those men on a dangerous task without radio. They will be out of visual signaling distance if the island wears its customary halo of cloud ... which the latest weather report indicates will be the case. Diversions come at odd times: someone has found a large fruit-bat clinging to the anchor windlass. Body is about 8 inches long, covered with brown fur. Wings black and leathery furled like a wet umbrella ... probably a three foot span. The wind and spray of our going rattle his framework and he turns sleepy brown eyes on his tormentors. Helpless, and yet so feral! The crater at Agrihan is erupting mildly. It was with combined relief and disappointment that I read this message: disappointment because a job I knew the Hanna to be capable of had been taken out of my hands, relief that I need not risk any of my men in a dark climb up an unknown mountainside. The pilot’s description of the crash scene virtually ruled out any chance of there being anyone alive, and I had to realize (time being no longer of the essence) that this was a job for professionals with full equipment. [36 hours later] Things have not gone well for the landing party; the route they picked was not the best, and they have been taken off the island and relanded at another spot. After transfer of the batteries, I went back to Asuncion for another look. This time the late afternoon sun had dissolved practically all of the cloud-cap. We still had hopes of locating the wreckage of the first plane. Nothing. Tonight we have only one thing to be glad of ... that we’re headed for Guam. I have just written the shortest night orders in my career (5 lines) and I made them so in order to write this before I collapse. It’s Christmas Eve, and I’m beginning to know what Christmas really means. The gift from Deity of part of Himself to live with us and be part of this world is the greatest and fairest gift ... its essence being the impossibility of return. Reciprocation thins. The gift should be sole. Thus our (attempted) gift will have some value, and I can find peace, perhaps, in knowledge of the attempt, even though we failed. The people who loved those ill-starred flyers can never know, nor can they ever reciprocate, the effort of our brains and bodies these seven days past ... but it is a joyful gift to give. As for death, I think only of it as only a comma in a long narrative.